Outdoor wrought iron hand railings can rust over time, especially after years of being exposed to rain, snow and ice. When the condition of the railing deteriorates to the point that metal primer and paint can no longer protect it against corrosion, it may be time to remove the old railing and replace it with new iron or aluminum railing. Changing a rusted railing can improve your home's curb appeal, and if you have the right tools, you can probably do the job yourself. Outdoor wrought iron hand railings can rust over time, especially after years of being exposed to rain, snow and ice. When the condition of the railing deteriorates to the point that metal primer and paint can no longer protect it against corrosion, it may be time to remove the old railing and replace it with new iron or aluminum railing. Changing a rusted railing can improve your home's curb appeal, and if you have the right tools, you can probably do the job yourself. Use an adjustable wrench to take off the old railing by removing the lag screws that fasten the railing to the house. If the railing was embedded directly into the concrete, cut the support posts level with the concrete stoop using a circular saw with a carbide tip blade. You will want to remove any rust stains from the concrete stoop. One way to do this is by squeezing the juice of a lemon directly onto the stains. Allow it to sit for a few minutes, but do not let the lemon juice dry. Scrub with a stiff bristled brush such as an old, hard texture toothbrush. In some cases, you may need to use a wire brush to remove stubborn rust spots. Visit a local home improvement retailer if you want to purchase prefabricated metal sections usually kept in stock. 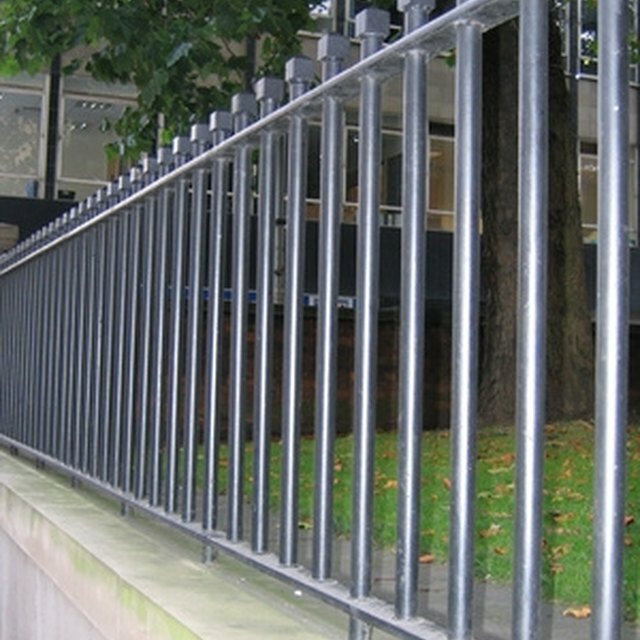 Select railing made of solid metal rather than hollow tubing. These will be more expensive, but the railings are more durable. Keep in mind when buying new railing that a metal railing is easier to install than a wood railing, and it requires less maintenance. Aluminum railings are a practical choice because they will not rust. This type of railing is affordable, easy to install, and usually available in a variety of different colors and styles. Railing sections also come pre-assembled. Position the new railing at least two inches from the edge of the stoop. Mark the drill holes and then pre-drill the holes using a 3/16" masonry bit. Attach the railing posts securely to the concrete or brick stoop using galvanized or stainless steel masonry screws that are weather and rust resistant. How do I Attach 2X2 Deck Balusters?